Straight to the point. My wife has been doing a bit of family research, very interesting but also a bit disappointing.. So far.. then dead ends. oops! She gave me a little project, to find out about one of her Great Aunts, who according to some information she had been passed, had been killed in a shipping accident (bombed, sunk.. you get the idea) in Hong Kong harbour. We had no dates of this, all we had was a name "Dolly". Eventually after searching for a while I found the gravestone in Rosemarkie Cemetery. 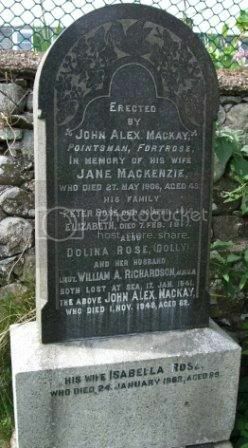 I knew that her family were originally from Rosemarkie & Fortrose. This gave my project a big boost. I found out that Dolina "Dolly" MacKay was married to William Richardson. They were on their way to Trinidad (H.M.S. Goshawk), Sailed from Liverpool onboard the "SS Almeda Star" on 15/1/41. Torpedoed & Sunk on 17/1/41, by "U-96" of "Das Boot" fame. I have managed to find the passenger list in the National Archive, found loads of stories of what happened on that day. Found Williams name on the Lee-On-Solent war memorial. However.. I'm still at a loss, can't seem to find much more information on Dolina. A few google searches & a few more, brought me to this website. Where I found the gravestone again. I have a question for Ghostwhisperer. Can you tell me where you got the "19 Brunswick Parade, Waterloo, Liverpool." address from? As quoted on your post. Additional information: of 19 Brunswick Parade, Waterloo, Liverpool. Wife of Lieut. William Antoine Richardson, R.N.V.R. (lost in the same incident). Reporting Authority: S.S. "ALMEDA STAR"
Additional information: Son of William and Jeanne Richardson, of Waterloo, Crosby, Lancashire; husband of Dolina Rose Richardson. Grave/Memorial Reference: Bay 2, Panel 6. That is the information taken from the CWGC site.